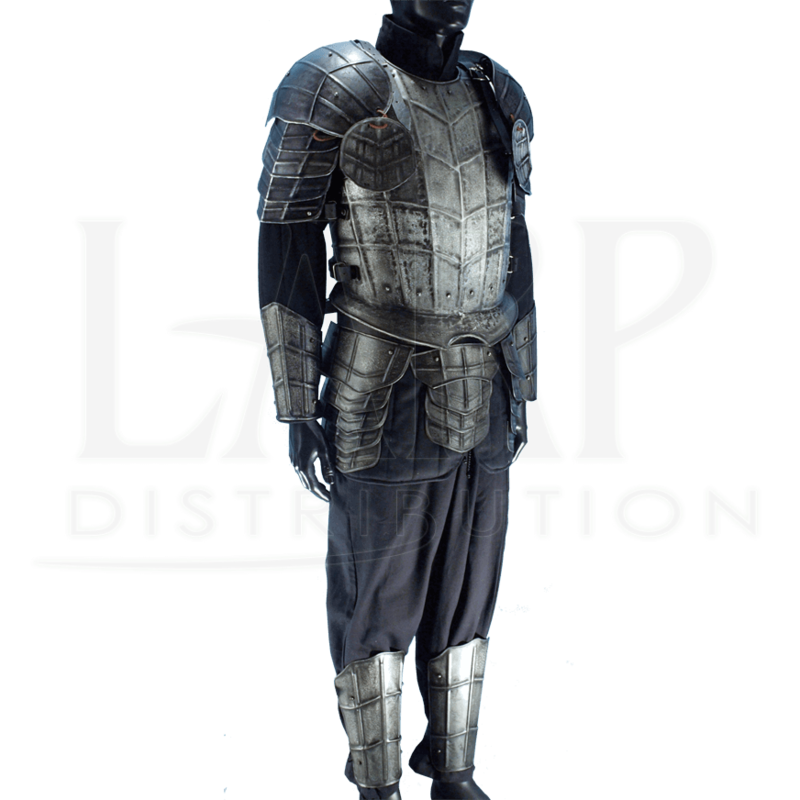 Reveal your ill intent and a crafty, cold-hearted nature while LARPing with the Dark Drake Complete Armour Package - Size Medium. The breastplate, Dark Warrior Backplate, pauldrons, bracers, tassets, and greaves are all included. Crafted from 18-gauge steel, the armour possesses a dark metal finish, coated with a special rust resistant treatment. Leather buckle straps secure and adjust the fit of each piece. A reptilian pattern with raised ridging, a V-shaped flange on the breastplate, and rivets increase the deflection capability. Whether you wish to become a battlemage, a ruthless dark knight, or a warrior of the undead, the Dark Drake Complete Armour Package - Size Medium will create the look that you desire. This is a great suit of armor. It is surprisingly light and the finish is beautiful. I've noticed that the finish rubs off slightly over time in areas where the plates overlap, like on the tassets, but it's in areas that aren't usually noticed. The tassets are very loud when walking or running, but some soft leather or light foam under the plates will fix that. The bracers too large for most people to wear, so I will have to use an arm gambeson to be able to wear them comfortably. Other than these issues, the suit as a whole is great, and the price on Dark Knight Armoury was far cheaper than anywhere else, and it was shipped very quickly.